Orange County, FL – Since 1974, the town of Pine Castle has been honoring their heritage with a celebration of unique Orange County history. Pioneer Days is a two-day festival held at Cypress Grove Park filled with demonstrations of original pioneer crafts, exciting historic reenactments, traditional music and storytelling and folk entertainment. On February 22 and 23, the residents and families of Pine Castle came together to celebrate this annual festivity. District 3 Commissioner Pete Clarke was also in attendance, provided remarks and read the official proclamation of Pioneers Days. Within a matter of just a few years, the entire neighborhood was referred to as Pine Castle. It was often considered the “most striking landmark between Orlando and Kissimmee” and is situated near the cities of Edgewood and Belle Isle, including the pockets of unincorporated Orange County that surround the Conway chain of lakes. In 1974, as Pine Castle continued to flourish and develop, the residents created an annual festival to celebrate their pioneer spirit. This year, Pioneer Days offered a wholesome, old-fashion lifestyle experience full of family activities and folk traditions. The festival kicked off with a community parade that followed a theme of trains and railroads. Throughout the weekend attendees enjoyed various events that celebrated their unique history. Preparations for the 2015 event are already underway. Organizers welcome volunteers with a passion for preserving our local history for future generations of pioneers. 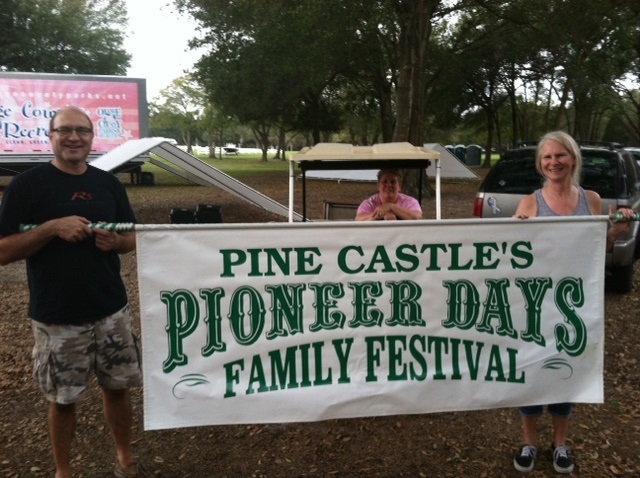 For more information, call (407) 427-9692, email pinecastlepioneerdays@hotmail.com, or visit the festival web site www.pinecastlepioneerdays.org.